Abstract: Omnidirectional or 360-degree videos are considered as a next step towards a truly immersive media experience. Such videos allow the user to change her/his viewing direction while consuming the video. The download- and-play paradigm is replaced by streaming, and the content is hosted solely within the cloud. 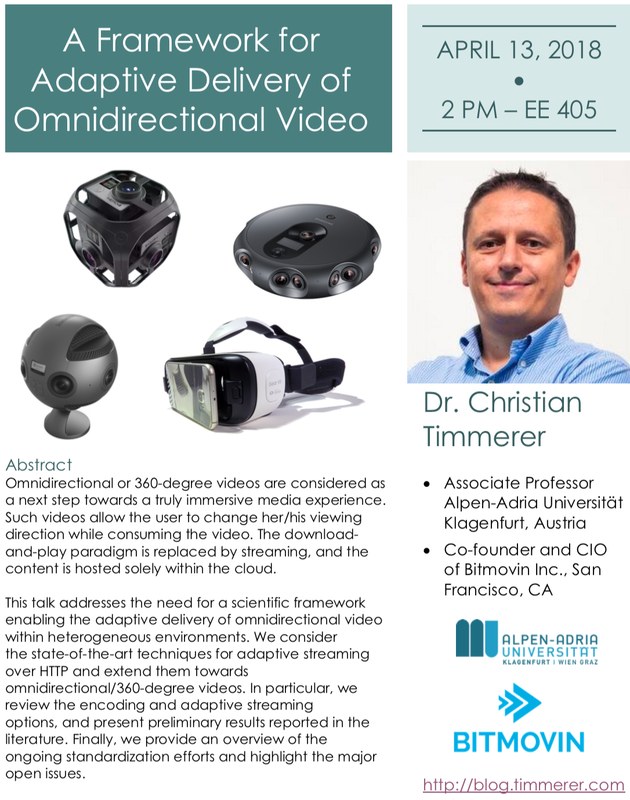 This talk addresses the need for a scientific framework enabling the adaptive delivery of omnidirectional video within heterogeneous environments. 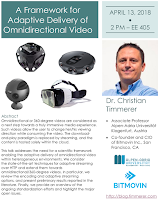 We consider the state-of-the-art techniques for adaptive streaming over HTTP and extend them towards omnidirectional/360-degree videos. In particular, we review the encoding and adaptive streaming options, and present preliminary results reported in the literature. Finally, we provide an overview of the ongoing standardization efforts and highlight the major open issues. PDF of the paper providing further details and slides of an earlier talk this year are available here.